An “evergreen” (or timeless) discussion topic at law conferences, such as the recently concluded ICSC Law Conference in Phoenix (a highly, highly recommended annual event) is the “exclusive use clause.” We’ve written about exclusive use restrictions, too many, many times, too many to furnish only a link or two. [If you want to see one or more of those postings, use “exclusive use” in the search box.] Today, we’ll talk a “little” law and we’ll throw in a bonus at the end. At the outset, we need to confess that our good friend and very smart colleague, Professor Tanya Marsh says much of what we will say, but does so a great deal better than we could ever hope to say, and she does that in a just published University of Miami Law Review Article. It is in response to the notorious Winn-Dixie case out of Florida and can be seen by clicking: HERE. Our own (practitioner’s) take on that case can be seen by clicking: HERE. When we write that the landlord won’t lease any space at its shopping center for the sale of widgets, that’s a personal promise by the landlord not to do so. It is a private deal between the tenant and the landlord. Most leases are crafted to bind their successors as well. It is the kind of agreement that can be called a “covenant,” and by its nature it is a “personal covenant.” That’s a legal characterization with implications under the law. The differences between a personal covenant and a real covenant are important. 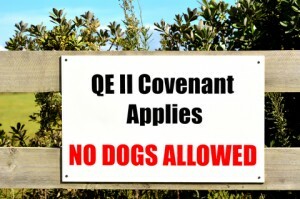 Tenants want real covenants. They are enforceable against their landlords and their landlord’s successors. Landlords want minimal restraints. Landlords who agree to give a tenant some form of exclusive use right don’t want to “junk up” the land records with a restrictive covenant that matches the exclusive use grant. We’re not going expand on any of that because every reader would be able to do so as well as we can, and depending on the particular reader’s predilections (or paycheck) with more passion than even we would bring to the table. As Professor Marsh most ably points out, the Winn-Dixie case conflated the landlord’s personal covenant that it (the landlord) would not behave in a certain way (i.e., the landlord wouldn’t lease to anyone else for certain uses) into a real covenant (i.e., no one may use the property for the prohibited uses). The technical route by which the U.S. Court of Appeals got there (in part, by driving down the road that Florida courts had paved) is not that important for today’s blog posting. Not all courts would do the same. So, the sure way to create a real covenant is to unambiguously state that the property itself is use-restricted, not just that landlord’s behavior is restricted. Another notable aspect of the Winn-Dixie decision is that it suggests that certain kinds of tenant (big, sophisticated) have a duty to inquire whether certain other kinds of tenants they see at the property had successfully negotiated for exclusive use rights. It appears that the court was thinking that such a duty of inquiry is an acceptable substitute for actual knowledge or for constructive knowledge (the kind that results from recording a restriction in the land records). Not every court will feel that way. So, what a tenant wants (and almost all landlords with bargaining power will resist) is a restriction of use of the land (not just against a landlord’s promise not to allow such a use). Tenants also want to get that land use restriction on the public record (by way of inclusion in a memorandum of lease or in a deed restriction). The prime reason tenants want what they want (or should want it) is that it enables them to act directly against offending tenants or other occupants, not just against their landlords. And, it enables them to do so without first convincing a court that when a lease says “Landlord will not lease to anyone who sells …,” it also means that people who sell “…” aren’t allowed to do so. Further, if the law is correctly applied, the remedy for violation of a personal covenant is “damages” and the damaged party needs to prove “how much” with acceptable certainty. The remedy for violation of a real covenant can be (provable) damages for past activities, but also can include getting an injunction against future violations. Yes, if the exclusive use right is protected by being in the form of “the property can’t be used for …,” the protected tenant can stop the use violation even if damages cannot be proven. Of course, the parties can negotiate other consequences for a violation, such as the right to terminate the lease or to obtain liquidated damages, often in the form of a rent reduction), but those remedies are between a landlord and a tenant, not between two tenants. Let us illustrate the difference. Suppose the first tenant at the property has a lease saying that the landlord won’t allow anyone else at the property to sell widgets and if it does so, the rent will drop from $1,000 a month to $500 a month. Now suppose a tenant who will be paying $30,000 a month comes along and one of the items it will sell are widgets. It won’t sell a lot of them, but it will sell some, enough to hurt the existing tenant. Think of the equation. For a loss of $500 a month, the landlord gets a $30,000 a month tenant. Morality aside, that’s not a bad business trade. On the other hand, if the property were use-restricted and the restriction showed up in the land records in the form of a memorandum of lease or a deed restriction, the $30,000 a month tenant couldn’t sell widgets. If it did, a court would (should) stop it. Is there a downside to relying on a real covenant as opposed to a personal covenant? Yes. The biggest one allows us to drag out an oldie but goody, our stand-by mantra: “Say what you mean and mean what you say.” Real covenants, as restrictions on land that will affect more than just the people who negotiated them, are interpreted and construed strictly. Parties coming along later had no part in the “intent” behind the covenant. So they must be unambiguous. If they aren’t, it will be as if they didn’t exist except that you’ll have the receipts for the legal fees you paid to unsuccessfully “save” the restriction. The last paragraph allows us to comment on a two week old New Jersey Appellate Division decision. It tells of a national coffee shop chain’s efforts to keep a national “hamburger” quick service restaurant chain from selling coffee at the same shopping center. We’re not going to delve into the technicalities, only the gravamen of the dispute. The exclusive use right granted to the coffee chain had some exceptions. The critical one was that tenants leasing premises with an area of more than 20,000 square feet were exempt from the restriction. The restaurant chain leased 40,000 square feet of land for a building with a floor area smaller than 20,000 square feet. Is that what the coffee chain had in mind when it agreed to the carve-out? We think not. You can find the court’s opinion by clicking: HERE, but it won’t tell you what we’ve just told you about the difference between the size of the leased land and the size of the restaurant building. Say what you mean and mean what you say.